The Learn to Learn Online MOOC: Supporting Novice Online Learner Development. Nathaniel Ostashewski, Martha Cleveland-Innes, Dan Wilton, and Nancy Parker. November 29, 2016, Pan-Commonwealth Forum (PCF) 8, Kuala Lumpur, Malaysia. Learning to Learn Online: A MOOC with a difference. Martha Cleveland-Innes, Nancy Parker, Nathaniel Ostashewski, and Daniel Wilton. October 21, 2016, The Online, Open and Flexible Higher Education Conference 2016, EADTU, Rome, Italy. A MOOC with a difference: Creating community for learning in MOOCs. Martha Cleveland-Innes, Daniel Wilton, Nathaniel Ostashewski, and Nancy Parker. October 5, 2016, 9th EDEN Research Workshop, Oldenburg, Germany. Learning to Learn Online: An AU Lunch'n Learn presentation, with Nathaniel Ostashewski, Marti Cleveland-Innes, Nancy Parker, Dan Wilton, and JoAnne Murphy. This presentation was recorded June 15, 2016. 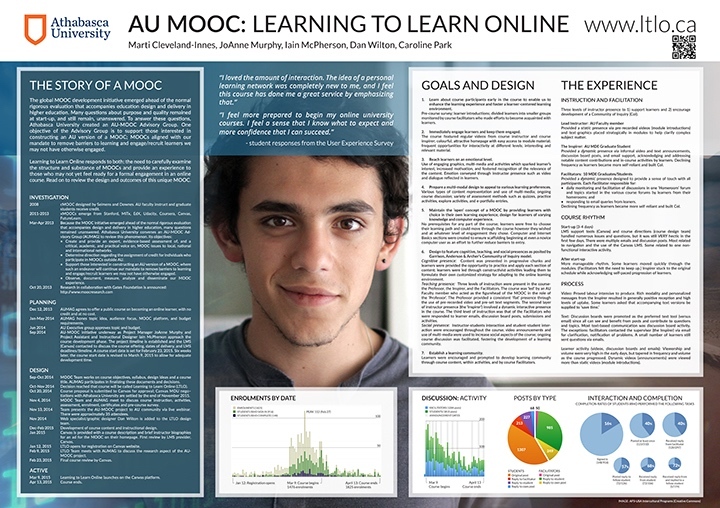 Understanding the Experience of Learning to Learn Online: A Case Study of MOOC Design, a presentation by researcher Nathaniel Ostashewski, project manager JoAnne Murphy, and project director Marti Cleveland-Innes. This presentation was recorded October 7, 2015. Learning to Learn was presented in a poster session by Project Director Dr. Marti Cleveland-Innes at the MOOCs in Scandinavia Conference, June 11-12, 2015 at Karolinska Institutet in Stockholm, Sweden. 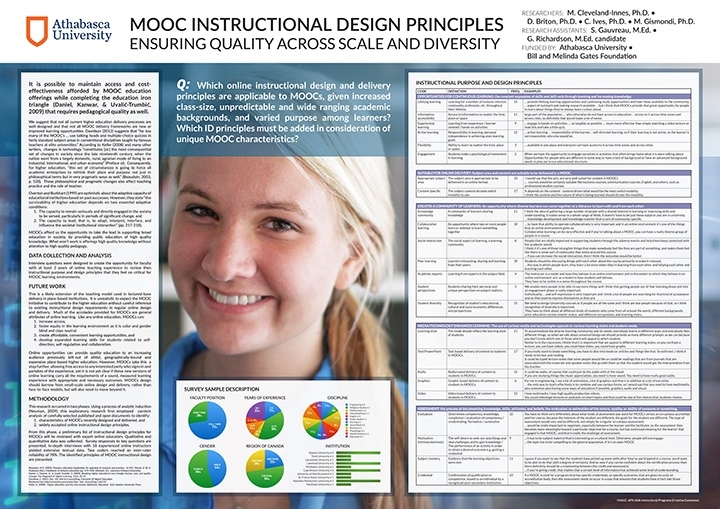 The poster can be downloaded below, along with a related poster summarizing the results of a survey of Canadian faculty on MOOC design principles.